Thanks for your interest in the How To Engineer Your Layoff affiliate program. I offer a 40% payout on the sale of each book. The average selling price for the book is $75, hence you will receive $30 for each sale. 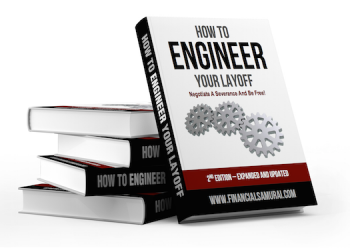 How To Engineer Your Layoff is the only product of its kind on the market today. It teaches people how to negotiate a severance so they can leave their jobs with pride and financial runway to do something more meaningful and exciting with their lives. The ability to empower people with knowledge and confidence is one of the most honorable and gratifying things you can do. The 120-page book was first published in 2012, after I engineered my layoff with a severance package that paid for 5 years worth of living expenses. My severance was instrumental in giving me the courage to leave a high paying job to try and grow Financial Samurai into what it is today. I have since updated the book to 150-pages with new strategies and new severance examples for 2019 and beyond. Overall, this book has taken me two years to write, and many more years to update and refine. Please take a look at the How To Engineer Your Layoff landing page which you will link to if you become an affiliate. Once one of your readers buys the book, the sale will be tracked on e-Junkie with your special tracking link. Payments will be paid within three weeks at the end of each month. To get an idea of the importance of negotiating a severance instead of quitting a job, here are some relevant articles worth reading. I trust once you’ve read one or two of the articles, you will understand the importance of how valuable How To Engineer Your Layoff is to consumers. How To Engineer Your Layoff is a great counter-cyclical affiliate product. It does well when the economy starts to soften and more people are afraid of losing their jobs. Even in good times, the book also does well during 4Q and 1Q each year when companies tend to lay people off and hire new people. As an online entrepreneur, it’s important to have a wide variety of products that can keep on producing in case the economy starts slowing down. A smoother revenue stream throughout the year is a better revenue stream. The book empowers employees everywhere to realize they have more rights than they realize. The book gives employees confidence to stand up for themselves and negotiate their worth with more confidence. Helping people navigate a very vulnerable time in their life is one of the most important things you will do. You will feel great knowing that you’ve helped people pursue their dreams. If interested in becoming an affiliate, please sign up here. Financial Samurai is one of the leading independent personal finance sites in the world. Established in 2009, Financial Samurai generates over 1.2 million organic pageviews a month and is a trusted source for financial advice. Sam has been featured in The Wall Street Journal, CNBC, Business Insider, Yahoo Finance, The Chicago Tribune, The LA Times and many more of the world’s leading finance publications. He has also done countless podcast interviews on the subject of severance negotiation strategies. Here’s one on Bigger Pockets Money from November, 2018 where Sam discusses his severance negotiation story.